Chances are you don’t write nearly as many checks as you used to. Years ago, people wrote personal checks for everything from an oil change to the grocery store. It wasn’t until the late 1980s or the early 1990s that many grocery stores even accepted credit cards. Try writing a personal check to your mechanic or grocery clerk now — they’ll probably look at you like you have three heads and need to call their manager. There are times, however, when checks are absolutely necessary. In these moments, it’s often critical to ensure that the amount written on the check is in the bank account of the person writing it. This is the purpose of a certified check. It’s a stamp of approval from the bank telling the recipient that they can be sure that once deposited, the money will successfully transfer to their account. This can be critical for larger transactions or purchases where a credit card is not appropriate or you don’t want to carry large amounts of cash. It’s a check that has been verified by the issuing bank. In most cases, it’s just a regular check that has been written out in advance. The bank then verifies that sufficient funds are available and stamps the check as certified by the institution. Because the bank has certified that the money is in the account, they then set aside that amount within your account. You won’t be able to withdraw it or otherwise use it. Instead, it’s held until it has been deposited into the account of the recipient. So can a certified check bounce? It’s virtually impossible. This is the reason why they’re a popular form of money transfer for large amounts of cash where a credit or debit card may not be appropriate or feasible. How does a cashier’s check differ from a certified check? A certified check is verified and guaranteed by the issuing bank. A cashier’s check goes through the same process. Where does the difference come in? The answer is where the money originates. With a certified check, the bank verifies that the money is in your account to be drawn on when the check is deposited or cashed. A cashier’s check works the same way, except that it’s not drawn on a bank account but paid for with cash. Instead of guaranteeing money is in an account, you purchase a cashier’s check in a way similar to a money order. Other than this small difference, certified and cashier’s checks are virtually identical. It starts out just like any other check. The first thing you need to do is fill out the amount, the intended recipient and sign it. Take the check to your bank and a teller will certify it for you. That is, the teller will verify you have that money in your account, put that money on hold and, usually, stamp the check as being certified by the bank. The bank then guarantees that amount to the recipient of the check. You must have a checking account in order to obtain one. If you do not have a checking account, you should be able to get a cashier’s check instead. You’ll just need to bring cash or use a debit card, if the amount is small enough, and it should work just the same as a certified check. In the end, a cashier’s check comes out of the bank’s account instead of your checking account. A money order may also be an option, though money orders usually have a limit to their value. The U.S. Post Office, for instance, issues money orders, but their limit is only $1,000. Money orders typically act the same as a cashier’s check. You pay cash and the money is drawn from the issuer’s account, not from your personal checking account. Certified checks, on the other hand, can be for any amount as long as sufficient funds are in your checking account. How much does it cost to have a check certified? No matter what you do with your bank these days, there always seems to be a fee attached. Whether it’s an overdraft fee or high ATM fees, they seem to be ubiquitous. Getting a certified check is no different and most banks charge you a small fee to obtain one. What’s the average cost of a certified check? Expect to pay anywhere between $8 and $15. This fee is sometimes waived if you have a specialized or premium account with your bank. There are also some occasions where the bank doesn’t charge for it or offers cashier’s checks at no charge. Check with your bank or credit union. Policies vary based not only on the bank or credit union but also on your relationship with them. If there is a fee, it never hurts to ask the teller to waive it. You may get lucky. What happens if you lose your certified check? Here’s a very quick word of advice: do not lose your certified check. As long as it isn’t fraudulent, it has been guaranteed by the bank that has issued it. They can’t simply cancel the check as that would defeat the entire purpose of it being certified in the first place. They also can’t just issue you a replacement check because then they would have two certified checks they are guaranteeing on the same amount of money. So again: do not lose your certified check. If you do, your bank will likely make you get an indemnity bond. Ever heard of an indemnity bond? Nope, we didn’t think so. Hopefully, you’ll never have to deal with one. What exactly is an indemnity bond? It’s a bond that guarantees the bank is not liable for the second check since they’re already liable for the first check. You’ll need to contact an insurance broker to see if they’ll even issue you an indemnity bond. If they do, your bank may still force you to wait 30 to 90 days before issuing you a replacement. Depending on your needs for the check funds, that can put a huge hamper on your timeline. Why do you need a certified check? Because it’s verified and guaranteed by the bank that has issued it, it’s considered just as good as cash. When you deposit one, the receiving bank usually makes you wait only one business day before having access to the funds. If the amount is over $5,000, however, they may make you wait until the check has cleared. It’s a great way to avoid carrying large amounts of cash around. It’s a lot easier to have one piece of paper than hundreds of bills. It keeps you from potentially being robbed and ensures a smoother transaction. Certified checks are also great for large purchases where you can’t use a credit card. One will likely be needed if you’re making a down payment on a house or purchasing a car with cash. While the main reason to use one is to protect you and the receiver from having to carry large amounts of money, it comes with another benefit as well. It creates a paper trail for a purchase and can protect you if any disagreements or misunderstandings arise between you and the recipient. It can also act as proof of purchase. It gives the receiver peace of mind that a hastily written personal check cannot. That’s not to say it’s impossible to forge a certified check, but it is a lot less likely. How can you verify that it isn’t forged? It’s not fool-proof and, as we’ve seen time and again, just about anything can be forged, faked, copied, or stolen. This is true for certified checks as well, though they are more difficult to forge than a personal check. Here is a short list of things to check for to determine if your certified check is real. In the end, however, it’s up to you to make the final decision on the matter. If you’re still unsure, deposit it and wait for it to clear before completing the transaction. Look for a watermark – If the check was specially printed by the bank, it may have additional identifying marks. Look for two signatures – Often times it requires the signature of two bank employees. Look for spelling or printing errors – This should go without saying, but if it’s a poor forgery it may have spelling or printing errors on it. Additionally, a forgery likely won’t have watermarks and may have bleeding on the printed portion of the check. Contact the bank directly – If you suspect that something is off, you can always call the bank and verify the check’s authenticity. If you are incredibly cautious, you may even want to go to the issuing bank and verify that it’s real. Know who you’re dealing with – A homeowner or bank receiving a down payment on a house is going to treat a certified check differently than someone selling a car off of Craigslist. If you don’t know the person making a purchase from you very well, it’s a good idea to go through the extra steps to ensure that you’re not being ripped off. What happens if you deposit a fraudulent certified check? If it’s fraudulent and you accept it and deposit it, you may be held liable for the entire amount of the check. It’s a good idea to authenticate the check if you’re unsure, or if you don’t personally know the issuer. It’s always better to be safe than sorry. Certified checks can keep the issuer and the receiver safe from mistakes and from fraudulent activity. It’s a convenient way to pay for large items such as cars, boats, or even a down payment on a house. They provide a much simpler process and, for many reasons, a much better option than carrying around large amounts of cash. As with any transaction, you have to be smart about it. If you’re the receiver, verify that it’s authentic. If you are drawing a certified check from your account, please make sure that you don’t lose the check. 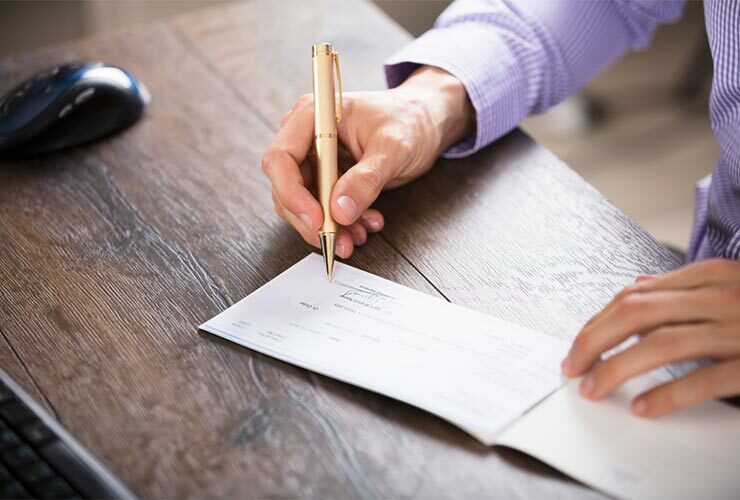 Certified checks can come in handy in certain situations but, as with any financial matter, be strategic and proceed with caution.